Our Lady from Rio Plata started her musical career in 1996 with a modest collection of songs on "Rara", which was released in 1996 by MCA Argentina. This album could surprise anyone even slightly familiar with Juana Molina's later work as it contains mostly guitar-oriented 'rock' songs akin to some more muscular, tighter and funkier The Sundays without reverbs and rather more complex structures. A quite solid if not particularly original album full of fine melodies, clever hooks and some efficient riffs produced by one of the biggest names in Latin rock and pop music, Gustavo Santaolalla, the guy responsible for the film soundtracks of "Brokeback Mountain" and "Babel", among others. Juana Molina has already found her voice, hum, vocally, straight-forward, throaty, a bit detached and velvety, somewhere between Astrid Gilberto and Suzanne Vega. 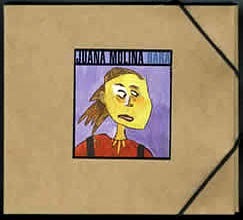 One song could show where Juana Molina is slowly heading, and that's "Busca Bien Y No Molestes", a beautiful, soft, melancholic thing with subtle percussion and tasteful violin and cello, the arrangement are pretty worked out and somewhat shows her further ambition. However, no one was prepared to what came next.